If you don't have a little plant lust in your heart, I'm not sure you can really be a gardener. Some trait -- color, form, scent, foliage -- speaks to you and you're a goner. Join in by sending email about the plants that have cast a spell on you. The newer generation of hydrangeas that bloom without fail have been getting high marks from gardeners and ‘Little Lime’ is the latest to take awards. It has just been named the Landscape Plant of the Year for 2016. The problem with many older mop-head hydrangeas is that they form buds on last season’s growth (“old” wood) and these buds can be killed by winter freezes even though the plant survives. Without blossoms, a hydrangea is just a boring green meatball. New plant breeding has introduced hybrids that bloom on old wood and on new shoots produced from spring through summer. Viola! “Ever-blooming” hydrangeas that have repeat flushes of flowers. ‘Little Lime’ is a dwarf version of the popular ‘Limelight’ known for chartreuse flowers that age to a rich pink. Just three to five feet tall, ‘Little Lime’ is well suited to smaller properties and to mixed borders where smaller shrubs mingle with perennials and annuals. It does well in part shade or full sun with adequate moisture. 'Little Lime' has taken gold medal awards in Europe and won a 2011 “Best New Plant” award from the American Nursery & Landscape Association. Trend-spotters are predicting that it will be a favorite with homeowners and landscapers in the season ahead. Proven Winners, which introduced this selection, will help you find a retailer. The winter landscape can look pretty dull and featureless – unless you plant a few things that really shine in the colder months. The shrubby dogwood 'Arctic Fire' positively glows in winter when its bright red stems are exposed to the long-angle sunshine of morning and late afternoon. Growing only about four feet tall and wide, it prefers a site with partial to full sun. Keep this plant well watered, especially during periods of drought. It thrives in damp spots and is an excellent subject for rain gardens. Smaller specimens also work well in containers. The best stem color appears on new growth, so a hard pruning in spring is a good tactic. Branches can be cut for holiday arrangements. To find a retailer, see Proven Winners. The majestic bur oak, Quercus macrocarpa was named Plant of the Year for 2015 by the Garden Club of America (GCA). 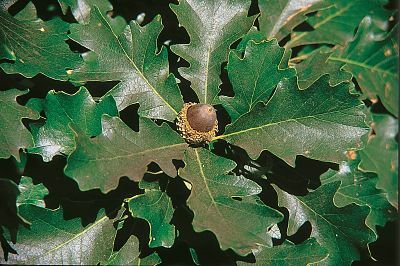 A native species noted for its beautiful shape and extreme hardiness, the bur oak can be identified by the fringed cap of its acorns. Dark green fiddle-shaped leaves are handsome through the season and turn a yellow-brown to russet color in the fall. Hardy in Zones 4 through 8, the bur oak often tops out at 100 feet when fully mature and commonly lives for more than 200 years. Tolerant of pollution, drought, wind and cold, these trees are very adaptable over a wide swath of the country – New Jersey, in Zones 6 and 7, is in the middle of its range. "Oaks are critical in supporting native pollinators and providing food and shelter for wildlife," says Alice Thomas of the GCA. "This outstanding specimen is ideal for parks, street-side locations and large yards." One source is the Arbor Day Foundation. Another is Online Plant Nursery. Some plants – some very garden worthy plants – cry out for a public relations team. While they include any number of handsome species, the worts and banes are a case in point. Worts are generally believed to be beneficial (woundwort, lungwort) and banes are generally repellent or downright poisonous (wolfbane, henbane). The plant known as bugbane does have insect repellant properties, but is mostly grown for its striking foliage and fragrant, wand-like flower appearing in August and September. In proper Latin nomenclature, this is the plant formerly known as Cimicifuga, more recently transferred to the genus Actaea. I ask you – are the taxonomists doing us any favors here? 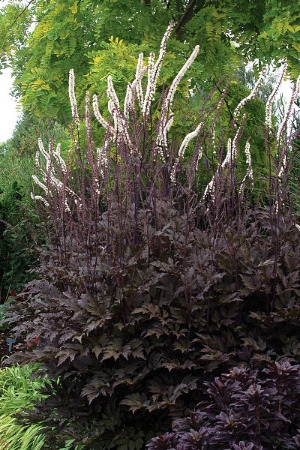 Stick with bugbane and look for purple-leaf types like 'Black Negligee,' which has especially fine and lacey foliage. This is a plant that makes a substantial clump up to 48 inches tall and 60 inches wide and can take full sun providing soil is kept moist. The flowers smell like grape soda, for what that’s worth. And perhaps needless to say, the bugs don’t bother it. 'Black Negligee' was bred by Terra Nova Nurseries, an Oregon wholesaler; find retailers or mail order sources on their website. Witch hazel is sometimes called winterbloom, which is a clue to its period of flowering. This small, shrubby tree unfurls its curious, strappy flowers early in the year, with most blooming in February or early March. The astringent fragrance of the flowers immediately brings to mind the cosmetic and medicinal preparations used to quell itchy skin and reduce inflammation from sunburn and rashes. This is an understory tree that prefers rich, moist soil and shelter from midday sun. There’s nothing spooky about it, by the way. The name comes from the Middle English word “wych,” meaning pliant or bendable. Forked witch hazel branches were the preferred tool of dowsers --the name adopted by American settlers searching for underground water sources, who exported their practice back to the Old World. There are three native American species and one each from China and Japan generally available from nursery growers. One source is Rare Find Nursery in Jackson Township (Ocean County) which hosts an annual festival devoted to the genus Hamamelis in February. Once you get past the bulb flowers -- snowdrops, crocuses, daffodils and tulips -- there are still plenty of under-used spring perennials to explore. One worthy subject is bergenia, a clump-forming plant with large, glossy leaves that often develop rich hues in fall and winter. How can you resist a plant with the common name of “pig squeak?” This refers to the noise you can allegedly make by rubbing a leaf between finger and thumb, although I confess I have not yet mastered the technique. In March or April, the plant sends up stalks that bear clusters of bright pink (or more rarely, white) flowers. Terra Nova Nurseries is busy producing new cultivars that have especially showy flowers and are worth a look. Give bergenia well-drained soil in full or part shade. It is said to be resistant to deer and rabbit predation, but mine get munched by something in winter and need protection. Find retail and mail order sources for Terra Nova varieties on their website or see Wayside Gardens.